The Eagles didn't drop Duce after they fired Chip Kelly. 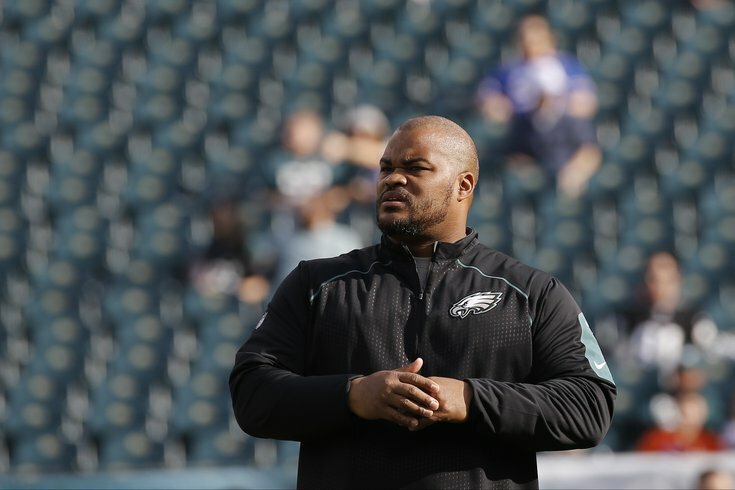 The 2015 Philadelphia Eagles had just two members of its coaching staff under Chip Kelly who were former players. They were running backs coach Duce Staley and tight ends coach Justin Peelle. The former coaching regime, or more specifically Kelly himself, was often criticized for not being able to relate to players. Pederson believes that coaches with playing experience have a better understanding of what it is to be a player in the league. "I think it helps to have played at this level, being out there when the bullets are flying for real and putting the pads on and being in that locker room, they understand the dynamic of the dressing room, of the locker room," Pederson explained. "They understand what it means to be a teammate, a leader on the football team." One of the clear initiatives of this offseason for the Eagles has been the focus on the quarterback position. The Eagles signed Sam Bradford and Chase Daniel to pricey contracts, and then gave up a bounty of picks to trade up for No. 2 overall pick Carson Wentz. They also hired former quarterbacks with 26 combined seasons as players in the NFL to be the head coach and offensive coordinator. "I think it helped in Kansas City that I played the position, even with Alex (Smith), because I was able to see certain things," said Pederson. "Even as a backup role, you’re still able to see things through a starter’s eyes that you can help a guy like Alex. I think it’s the same here. Frank (Reich) and John (DeFilippo) can help. Frank and I obviously played at this level and John having experience and has coached it, it all helps that we played the position." Pederson also explained how the other positional coaches have certain advantages. "I think someone like Duce that has played the running back position at a high level can share his experiences with the young running backs. Even with Ryan and Darren and Kenjon, veteran type guys, but he can still shed some light based on his experiences in the league. "Eugene Chung played the offensive line. But I don’t think it’s necessarily what I looked for but at the same time I think it helps you have played a position at this level. Greg Lewis same way. He’s brought so much to those guys. He has taught them how to work and what it takes to get to a Super Bowl. Tim Hauck is another one who has played at this level. Phillip Daniels, even though he’s in that assistant role, he’s played the position. He understands, he knows. It’s all part of being a teacher sometimes is using your experiences in these current situations to help teach these guys." As a player, Pederson was often on teams that had former players as part of their coaching staffs. “It actually went back to Mike Holmgren. I saw that with him when I was a player in Green Bay. Even all the way back to Don Shula for that matter, with the guys he had around him. He had some former players, Larry Seiple, Joe Greene, guys who played positions he surrounded himself. “Then in Green Bay with Mike Holmgren, he brought in guys that were great teachers, educators, guys that had played the positions. Andy did the same thing.